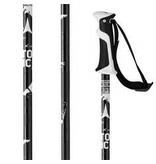 Dominate your local resort with the versatile and durable Atomic AMT2 Ski Poles. Lightweight and strong, these poles offer the support you need in all kinds of terrain without compromising on weight. Whether you're crushing corn snow, railing groomers, or lapping the park, the Atomic AMT2 Ski Poles will offer you all around support and balance.